Come to the library to experience the latest fitness craze - GOAT YOGA!! 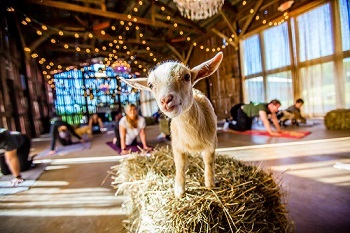 Licensed Massage Therapist and Yoga Instructor Ann Francart will lead Two, Half-Hour Length Yoga classes, while students enjoy the company of diapered baby goats that are owned by Winneconne area resident Becky Mills. Book Club at the Winneconne Public Library meets on the Third Monday of each month, at 2:00 pm. The library will have many copies of each title, simply stop at the circulation desk for a copy!